After a week and a half of organizing, throwing lots of detritus away, and planning, I am ready to begin producing today. This morning I will begin readying my clay for casting (pictured here). Getting the clay ready after about two weeks of sitting in my tanks will take all morning. I reclaim about 20 percent, meaning dry, used clay is worked into newer clay and all put into a huge blender, called a blunger. This afternoon the casting begins. I am making first stage pieces today that will be samples for my spring and summer collection. 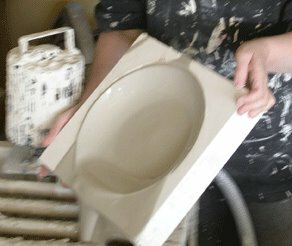 Hopefully, by the end of the day tomorrow, I will be able to load the first bisque kiln of the year. 2006 is looking like a very good year here at davistudio. One of my goals this year is to decrease my turn arround times for shipping. I plan to do this by having a wee bit of inventory and increasing my efficiancy in the studio. I will be making a few things for Valentines Day, which will be wicked cute. I'll keep you posted! Pink and red, dots, stripes and solids, to be shown here first!